Greetings! 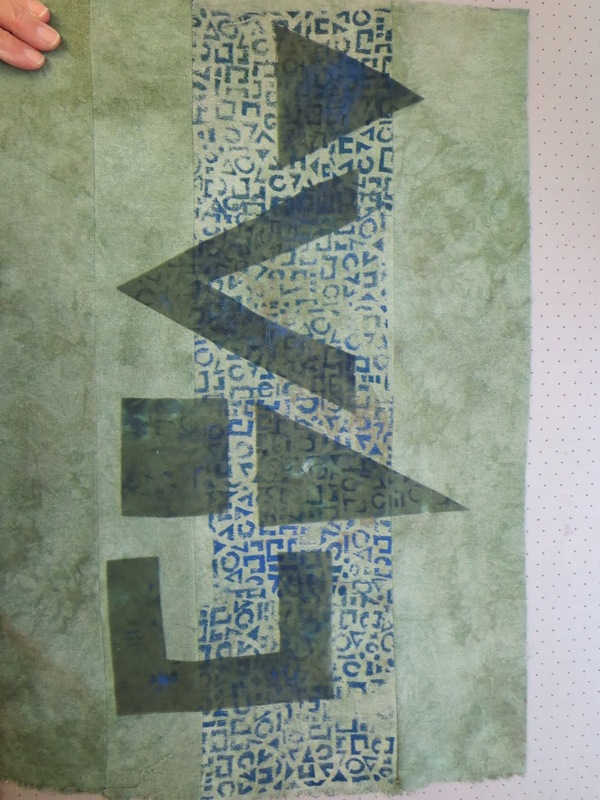 Leslie Tucker Jenison here with a bit of fun using Jessica Sporn's new "Runes" stencil. 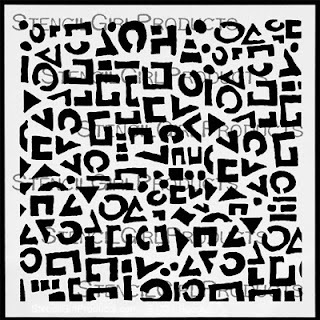 Click here to see the "Runes" stencil on the StencilGirl website. Runes are ancient types of script. They are actually quite fascinating so I invite you to read the link. I love all types of written communication in the form of text and letters so this stencil has a special appeal for me. In addition, I love the shapes embedded in this stencil. For this project I plan to use fabric: pieces of silk noil and silk organza that I hand-dyed with ProcionMX fiber reactive dye. They have been languishing in my stash so it was time to pull them out and play with them! Here is the silk organza: a dull green with some blue-green marks from the shibori resist. I am planning to mix these two paints. Testing the paint colors on a corner of the silk noil. I used a 6" x 6" Gelli gel printing plate from Gelli Arts. Using the brayer I smoothed the paint over the gelli plate surface. Then, I placed the Runes stencil over the plate. And gently placed the strip of silk noil over the stencil. Using my fingers I pressed the fabric into the stencil, smoothing across the surface. 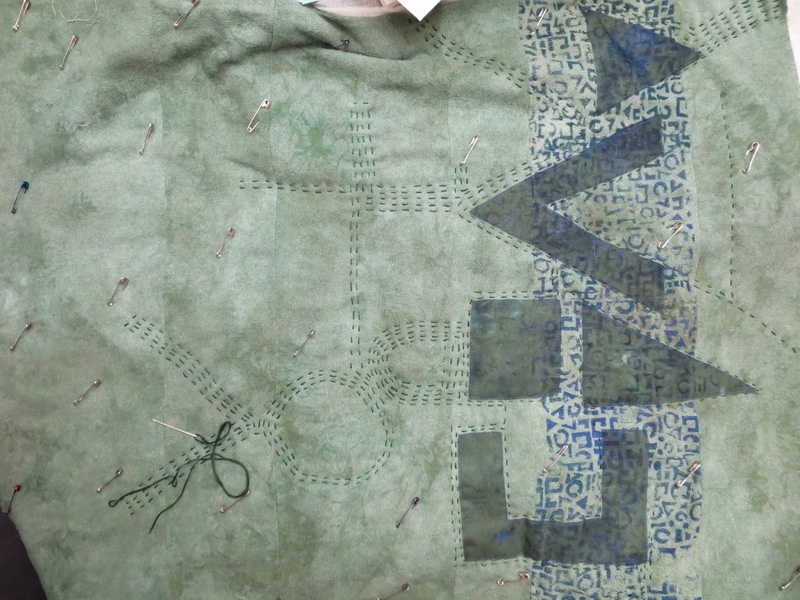 Here is how the fabric looks after picking up the paint thru the stencil. Cool! The nubby quality of the silk noil softens the marks that are picked up through the stencil openings. I cut the remaining silk noil into strips of varying width. Using a sewing machine I pieced the strips together, varying the placement. I did this to increase the textural quality of the dyed fabric. I inset the printed length of silk. Then, I evened up the edges of the printed noil. I heat-set the paint on the silk noil, then I fused portions of the silk organza with Mistyfuse. Mistyfuse is, hands-down, my favorite fusible. It is gorgeous under all fabrics (lightweight and does not change the hand of the cloth!) but never more so than under sheer organza. It is invisible! 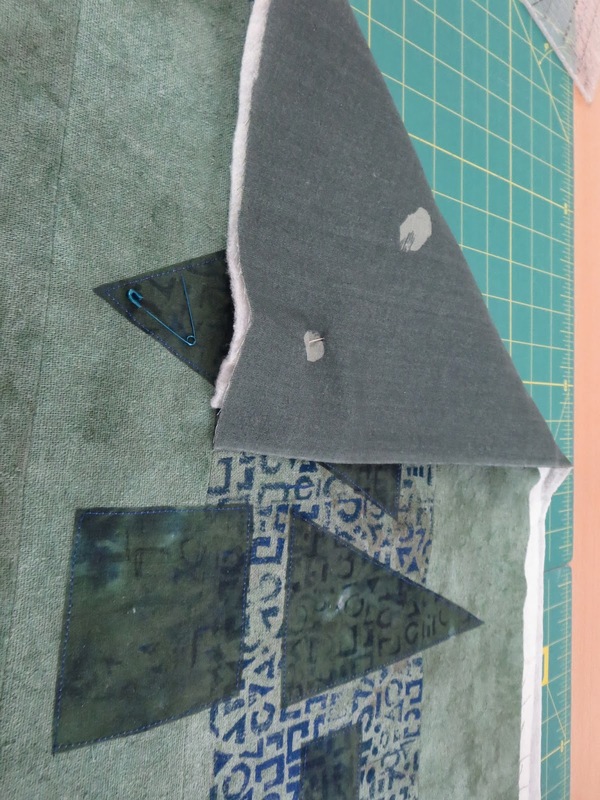 I placed the large-scale "Runes" over the pieced surface of my silk construction. Using blue thread I appliqué around the edges of each piece to assure stability. This is necessary to prevent lifting of these fused shapes during use. is slightly larger than the surface. I used a loose-weave Japanese double gauze fabric for the back. I pinned the construction in place to maintain the quilt "sandwich" and prevent shifting. Pinning should be frequent enough to maintain the quilt sandwich. I haven't marked the surface of my project: I'm simply stiching where I want to. In this case, I am working around the edge of one of the fused pieces of organza. 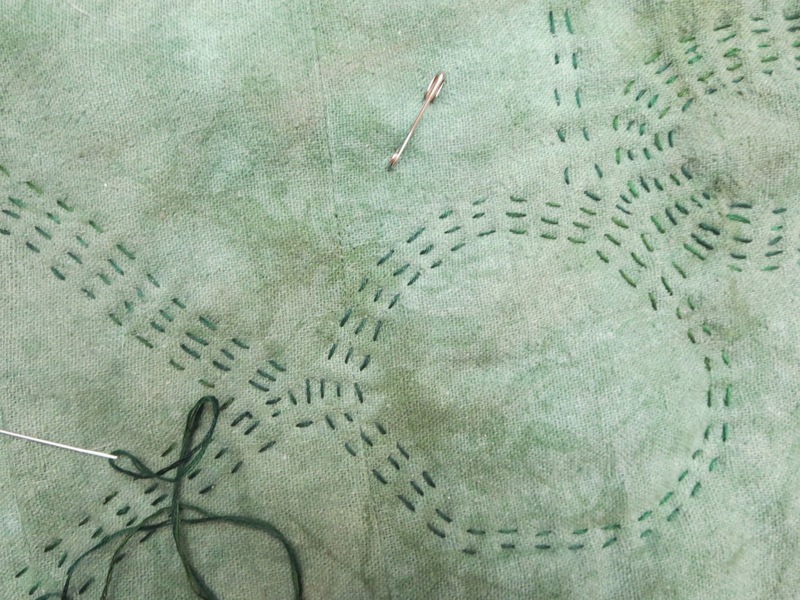 My intent with the stitching is to reference the shapes of the Runes. As I reach one of my pins I remove them. The stitched areas are stabilized by the thread. I am not finished, but have used the afternoon (chilly!) to enjoy my handwork. 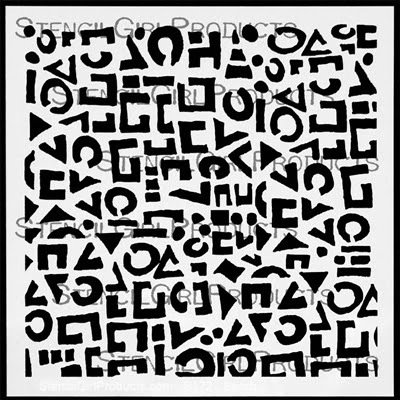 I hope you will try this stencil with fabric. The shapes in the Runes marks are full of possibilities! I love the freehand quilting! Thanks for sharing! Ohhh Beautiful! Really stunning! I hope you share the finished piece! wow.. what a journey! This looks great! So much info...thanks for that. Oh Leslie...this is so beautiful...I can just feel that wonderful silk! Can't wait to see it when its finished! This is absolutely stunning, Leslie! Love seeing your process! 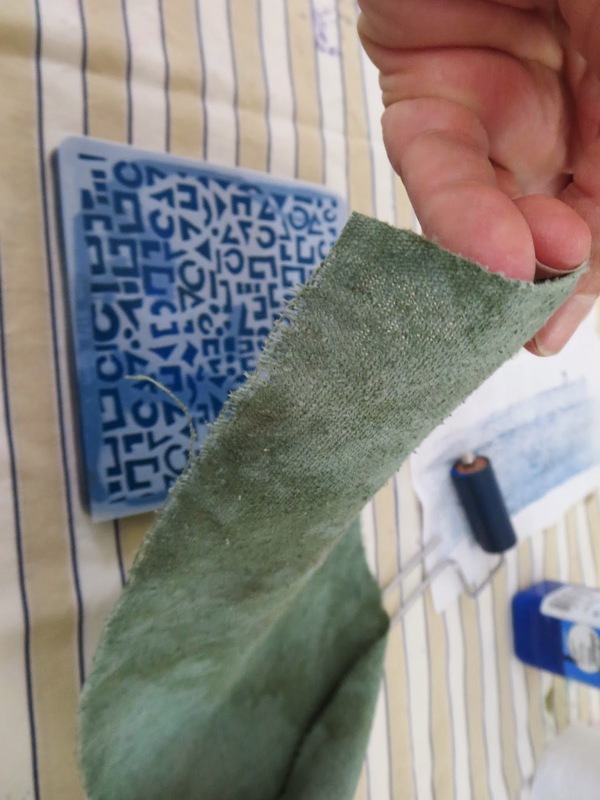 As a piecer-n-hand-quilter, *and* gelli plate enthusiast, this is such an inspiration! Love seeing your process and truly appreciate you sharing it with us. Thanks for all the great feedback! I'll get this project finished and will add a photo when I do! Love this!I stand and salute your genius and patience!